Berlin/Brussels/Geneva/Washington – A new report released today warns that the European Commission’s proposed Multilateral Investment Court (MIC) threatens to lock in an undemocratic investor-state dispute settlement (ISDS) scheme that undermines national democratic authority and prioritizes corporate profits above all else. Authored by the Center for International Environmental Law (CIEL), Seattle to Brussels Network (S2B), and the Rosa Luxembourg Foundation, A World Court for Corporations: How the EU Plans to Entrench and Institutionalize Investor-State Dispute Settlement reveals that the EU’s proposal for a global investor court is a dangerous effort to salvage the failing investor-state dispute settlement system by replacing it with a rebranded copy. As corporate influence over public policy at every level of government grows ever greater, measures to hold corporations accountable have not kept pace. Around the world, ISDS is heralded as the epitome of this power imbalance. In the name of protecting investor rights, governments are being forced to pay foreign corporations for actions taken to serve the public interests, such as protecting workers or preventing environmental harm. The report comes just as countries wrap up a week of discussions about ISDS reform at the UN Commission for International Trade Law (UNCITRAL), where the EU hopes the MIC can be negotiated. Many countries noted that growing public concern about the excessive powers granted to multinational corporations under ISDS has led to a crisis of legitimacy for its very premise. Like the Commission’s MIC proposal, many of the countries meeting in Vienna appeared more concerned with how to re-establish a social license for ISDS, rather than address its fundamental problems. While countries were frank about the significant threats posed by ISDS to their domestic laws and courts, few demonstrated the political appetite to confront the system head on. The report analyzes how the MIC would address suits currently in the ISDS system, details eight specific dangers posed by a world court for corporations, and provides ten reasons (of many) to oppose the MIC. 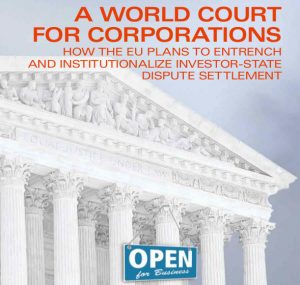 While EU Member States will soon decide whether or not to grant the European Commission a mandate to officially negotiate a world court for corporations, States will meet again at UNCITRAL in April to discuss how ISDS should be reformed. « Firma: ¡La política de Comercio y de Inversión de la UE debe ser democratizada!